Ape Dread, Dog Worry: Animals And Anxiety : 13.7: Cosmos And Culture Anxiety seems uniquely human, doesn't it? It's that ability to imagine the worst, the danger lurking in every uncertain outcome. Commentator Barbara King says we are not alone in these feelings. Like joy and grief, anxiety is something we share with certain other animals. Chimpanzees and elephants sometimes get anxious. Dogs and cats too. They are aware creatures who — at times — becomes fearful about the bad things that might happen (or happen again). Those are my conclusions after years of reading the animal-behavior literature and observing and caring for a variety of animals. This week, I reflected upon them anew as I read Scott Stossel's brilliant and brave book My Age of Anxiety: Fear, Hope, Dread, and The Search for Peace of Mind. Gripped by anxiety and phobias since childhood, Stossel offers a wide-ranging account of how anxiety has been understood historically and how its etiology and treatment are nowadays fiercely debated. Mixed in are fascinating, often harrowing, vignettes of his own experiences with anxiety, one of which I'll discuss in a moment. I bought the book after reading rave reviews — The Boston Globe calls My Age of Anxiety "astonishingly thorough and lucidly written" and "an epic piece of synthesis" — and because a tendency toward anxiety runs in both my husband's extended family and my own. I wanted not only a state-of-the-art overview for a non-expert but also a description of how it feels to suffer from severe anxiety. And on the last point, Stossel minces no words. He writes of "complete, all-consuming dread," saying that all he wants when coping with a phobia "is to escape — from terror, from consciousness, from my body, from my life." Is anxiety an animal instinct, something we share with rats and lizards and amoebas? Is it a learned behavior, something acquirable through mechanical conditioning? Or is it, after all, a uniquely human experience, dependent on consciousness of, among other things, a sense of self and the idea of death? Later on in the volume, Stossel makes the occasional reference to anxious monkeys. But mainly he decides that anxiety is a human condition. Given that my own conclusion is quite different, am I ramping up to criticize Stossel for failing to understand the complexity of animal cognition and emotion? Well, the answer to that question is "no." I admire Stossel's book. I think that his linking of anxiety with our species flows from two sources: the definition of anxiety that he adopts, and the vivid, highly cognitive and linguistically mediated terrors of his own experiences. Anxiety is apprehension about future suffering — the fearful anticipation of an unbearable catastrophe one is hopeless to prevent. Stossel has felt that very fear in its awesome depth frequently over the course of his life. That fact comes across vividly in his discussion of emetophobia, or fear of vomiting. What a haunting section of the book! Stossel last vomited "during the early evening of March 17, 1977" — over 35 years ago. During those intervening decades, however, he has been consumed with the fear that he would vomit. The fear compelled him to surround himself with motion sickness bags, over-the-counter medicines and detailed information about the location of norovirus outbreaks. At one point, while at Boston University's Center for Anxiety and Related Disorders, he agrees to desensitization therapy. He gives a speech in front of a small audience (hand-picked for the occasion) while a tape-loop of people throwing up plays on a television. Eventually he agrees to take ipecac, a substance meant to induce vomiting, so that he can work through the experience with trained anxiety professionals. I won't reveal what happens, but it's unforgettable reading. No ape, elephant, dog or cat would or could suffer in the way that Stossel has suffered with his emetophobia. What his brain puts him through — how he uncontrollably propels himself through a labyrinth of excruciating worries and imagined horrors — has to be uniquely human. Even as I see this, though, I feel sure that there's another equally valid, and very important, way to think about animal anxiety. For one thing, the rats, lizards and amoebas Stossel mentions aren't the most likely candidates for anxiety. For another, Stossel says that animals have no abstract concepts of the future or anxiety, no abstract awareness of the possibility of their own deaths. We humans, unlike other animals, he writes, have the "capacity to be consciously aware of the sensations of fear, and to cogitate about them." Yet apes and elephants, dogs and cats can be consciously aware of their fears and can think about them. Chimpanzees are similar. The most devastating account I've read of ape anxiety comes from Andrew Westoll's Chimps of Fauna Sanctuary (read my review at Bookslut). Westoll introduces us to apes rescued from high-stress situations like biomedical labs, including Rachel, who carries around a pair of stuffed tiny gorillas for comfort, but who succumbs to such overwhelming anxiety that she attacks her own limbs. Our study shows that previously traumatized chimpanzees demonstrate persistent abnormal objective symptoms and that these symptoms cluster into syndromes that are similar to PTSD and depression. Of course, we needn't look only to journal articles and books to become convinced that animals may suffer from anxiety. I'll never forget sitting with my husband about 15-years ago in the waiting room of a feline veterinary specialist who was about to examine our dear cat Mickey's fibrosarcoma tumor. As we waited, a vet tech came from the back room and gently led a large dog away with her — away from the dog's human companion. The dog clearly didn't want to go, and even as he was coaxed to move forward, he turned his head back towards his human. Both my husband and I were struck by the look in his eyes — deep worry and anxiety are the best words in my vocabulary to describe it. 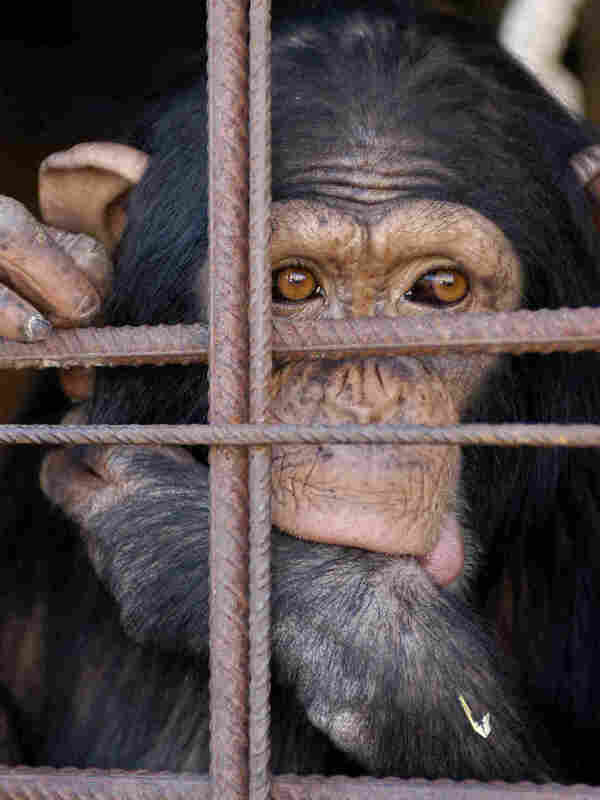 Do we really want to say that these animals — chimpanzees and elephants, the cherished companions of our own lives — are not consciously aware of their sensations of fear? That neither makes sense nor fits with what we know about their problem-solving and emotional capacities. Elephants', chimpanzees' and dogs' emotional experiences of the world are not identical to ours. But we should acknowledge that other animals are prone to anxiety. Knowing that they are is one big reason why it matters, a lot, how we treat animals. It's our responsibility to keep them out of situations — poaching zones, biomedical labs, stressful captivity — that cause significant anxiety. And when they do experience the terrible physical and mental tolls of anxiety, it's our privilege as well as our responsibility to show animals love and comfort. With that mandate of empathy for anxiety sufferers, I'm certain Scott Stossel would agree.